Even before this blog was up and running, my Facebook profile was famous amongst my friends for my posts of food. I wouldn't post any reviews or anything like.. Just the pix that Rina would take. from our numerous adventures. My very first post in this blog was on June 25, of 2010. Although I registered the blog name at around September of 2009, after my brother introduced me to a show that would change my life - Travel Channel's "Man V. Food". Seeing MVF host Adam Richman travel from city to city to take on the most amazing pig-out spots, It became clear as day what I wanted to do with my life. Since I'm not going to be signing up with a major network any time soon, I thought the best way to do this would be through the blog. When I first tossed around the idea to a friend, she said, "How can you make a blog about food, when you're such a picky eater?". And just like that, the concept of "The Pickiest Eater In The World" was born. Why hide behind it, right? It's true anyway, so I might as well be proud of it. I hate to belabor the obvious but, I love to eat - and that is something that everyone who knows me has become very much aware of. But it isn't just my love for food that has become stuff of legend - it's the kind of food I eat. I'm known for eating the most unhealthy food known to man. "Oily", "Fat", "Greasy".. All those words that would make a normal eater shudder, are actually music to my ears. I could seriously live off a diet of Bacon, Liempo, and fast food (although it probably wouldn't be a very long life). But I'm also known for the things I don't eat. Like simple food, such as anything with tomato, shrimps, crabs, squid.. and basically all vegetables.. I always believed that it was a phase that I would eventually outgrow.. but.. apparently not. Back in August, I was studying ways to get my blog more exposure. In my quest, I found that the food directory website that I would go to, www.myfoodtrip.com, allowed for posting of reviews. Since I had quite a few already up on my blog, I posted my links to the review pages of certain restaurants. Maybe I flooded their system or something (Or perhaps it was my dashing good looks? 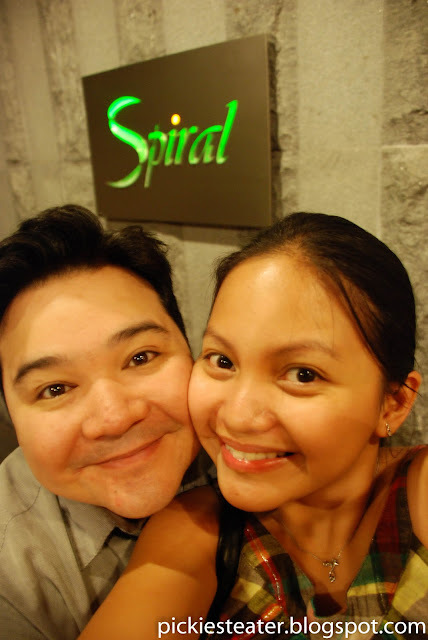 ), but for some reason, I caught the attention of the lovely Leslie of Myfoodtrip. It was in our exchange of emails did I realize that www.myfoodtrip.com wasn't merely a comprehensive food directory to find restaurant menus, reviews and addresses. No, it was much more than that. myfoodtrip is actually the home to a community of people who all share a common passion - a love for food. She encouraged me to take part of the weekly promos (which admittedly, I have yet to do). It was the enthusiasm of it's members that endeared myfoodtrip to me. Even if I wasn't an active participant, (a "lurker", if you will) It was fun seeing people go crazy over the simplest Gift Certificates.. But their fervor wasn't so much in what they would win.. It was all about the feeling of being a part of a group who shares their infatuation with anything edible. 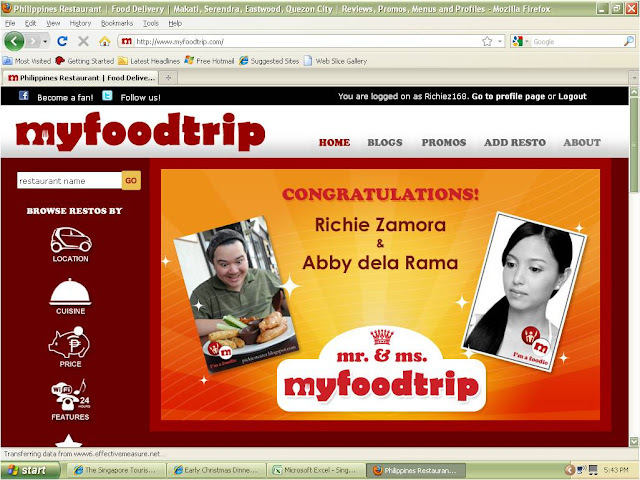 When the promo for the search of "Mr. Myfoodtrip and Ms. Myfoodtrip" started, I honestly didn't consider myself eligible for the contest. Although it sounds like something that perfectly applies to me, the fact was, I wasn't active in the myfoodtrip fan page, so i didn't think I'd be considered. Also, I've never been one to campaign for anything.. even when I was in school.. I'm not too keen on any form of politics.. As I prefer to fly under the radar instead. I told Rina about the promo and she said that she couldn't think of anyone more perfect for the title than me. I told her about my hesitation, which she scoffed at. I then asked her, "Do you think anyone would actually vote for me?" She laughed and said, "Are you crazy? Of course!". Later that same day, she mentioned the contest to her sister, and she said that her boyfriend Don, read about it as well, and said I was the first person he thought of. And in some funny twist of fate, while Rina and I were discussing it, Leslie emailed me, and asked if I saw the promo. I said, Of course I did and promised to pass the info around to my friends. I also mentioned that Rina and I were considering it. She wrote me back, encouraging me to join, because not only would I get a prize, but it was possible Rina would too, just for nominating me. I expressed my disappointment of there being a lack of a swimsuit competition in the contest, much to Leslie's... umm.. delight/disgust? The deciding factor for me, though was when Rina said, "Think about it this way.. This could be a great way to promote your blog as well". So.. The rest was history.. Rina wrote in my nomination on the day of the deadline.. And I was fortunate enough to be selected..
My full name didn't match any of the blanks, so I had resolved that I didn't win, which was fine. But then I got curious. If I didn't win, I wonder who did? So I looked at the other candidates names, and i discovered that, none of their names matched the clues either. That was pretty much all the confirmation I needed. All the letters fit into place. I immediately called Rina to explain what my earlier text had been about, and she was ecstatic! I told her to join the game as well, so she can avail of a prize. I actually considered coaching her, but it was a good thing I didn't because my guess of "PICKIEST EATER RICHIE & ASTEROID GIRL ABBY" would've been way off. When the winners were finally announced, I called a few of my closest friends who expressed their happiness for me as well. In the grand scale of life, winning an online contest from a foodie website may not exactly be exactly the equivalent to a Nobel Prize or anything like that, but it is an affirmation to me that, what I'm doing.. this blog I'm writing, is being read by people all over the world. Some people were meant to teach. Some were meant to save lives. Others were given the power to heal. While a select few, were destined for greatness. Me? I was born to eat. I think I can live with that. So THIS is what victory tastes like hehe..
After all was said and done, Mr. and Mrs. MyFoodTrip celebrated that following Sunday night with Dinner at the country's longest buffet - Spiral at Sofitel - The place I stated as my favorite place to eat at in my candidate profile (Post to follow). Once again, from the bottom of my heart, thank you to everyone who voted for me, and Thank you to everyone who's been reading my blog. It's been a hectic past few weeks so i haven't been able to post the way I used to, but I'll make up for it during the holidays, I promise. This is so surreal, haha. THANK YOU Rich for this wonderful post! :) We really appreciate it, and your participation in our promo. Can't wait to catch up on your posts over the holidays! I miss my dose of the Pickiest Eater over lunch break. You're most welcome, Leslie.. It's been a blast.. looking forward to the future! hehe..
You should see my cheetah skin speedo first, before you knock my proposal for the swimsuit competition! Thank you so much Rozielle!